Hover over the colored circles for more information about the site. Click them to go to that specific sites page. This trail map is set up as a practical guide to help birders that are new to the area or new to birding, find the best birding sites in the Eastern Panhandle of West Virginia and Washington County, Maryland (the PVAS service area). These are the areas that the local birders bird. Birding can be a year-round activity, but requires being at the right location at the right time of the year, which in turn, is based on the migration patterns of the different families of birds. A great variety of birds migrate through our area in the Spring and there is a large number of excellent sites to bird. In this map, these areas will be designed by “Sp” after the name of the site. There are many sites where migrants will remain to breed during early summer. These areas will be designated by “S” after the name of the site. In late June through September, south bound shorebirds and other migrants begin to show up in local ponds, drainages, fields, and woodlands before moving farther south. While not appearing in large numbers, they provide birders with opportunities to observe these interesting birds during this brief window of time. They will be designed by “F” after the name of the site. Finally, a large variety of ducks and grebes start appearing along the Shenandoah and Potomac rivers and local ponds in late October and throughout the Winter. These sites will have “W” after their names. 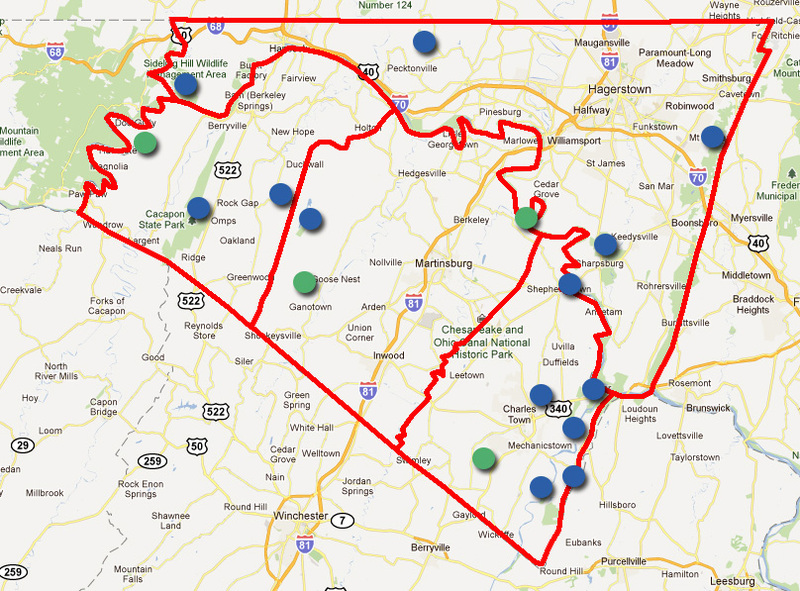 The green dots on the above map are preserves that are owned and operated by PVAS. These sites are typically more developed and will have field trips and special events taking place regularly throughout the year. Please see the calendar section of this website for details. Shorebirds can be observed in several key locations in the four County area that PVAS serves. Please follow this link to the Shorebird Locations Page. Also in our area are two hawk watches that are close enough to the Eastern Panhandle for area birders to visit. These are Washington Monument State Park in Washington County, Maryland and Snickers Gap in Virginia. Both sites present excellent raptor watching opportunities from mid-September though mid-November. These sites will be added before the fall raptor migration. Of course, many birders leave the area for optimum seasonal birding in such areas as Dolly Sods Wilderness Area in West Virginia, the Eastern Shore in the Delmarva Peninsula and hawk watches at Waggoner’s Gap or Hawk Mountain in Pennsylvania. One can obtain information on birding in these areas on the Internet.